Reigate Netball Club are looking for a Level 2 Coach to help further develop as teams and a club. We have 2 teams in the Surrey Netball League, one in Division 2 and one in Division 7. We also have one team in the Kingston League in Division 7, which is a mix of our two Surrey Teams. 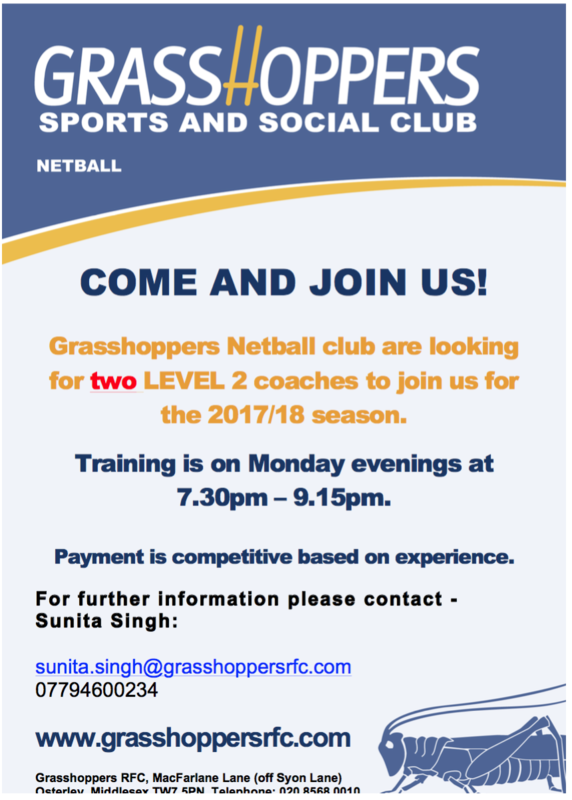 We are a fun, friendly club who are passionate about playing netball and want to continue to improve our skills. Barnes netball club are looking for a level 2 qualified coach to take training alternate wednesday evenings at Raynes Park High School, 7.30-9pm for our A and B teams. Pay is £40 for the 1.5 hours. If someone can attend the A team matches, that would be a bonus but we would consider coaches who play. We are also looking for players for the 2017-18 season. We play in Kingston Division 1. We also play alternate weeks in Prem A and Division 4 of the Surrey league. We are looking for positions for our Div 1 and Prem A in particular but will consider all players and positions. We are looking at recruiting a few more netball pros at St George’s, Weybridge. The coaching would cover both our junior school and college. We would be looking for Level 2 coaches. If you have anyone that may be interested for any of these hours please pass on my details and ask them to get in touch. During the main netball term there are the following sessions, once we have availability of coaches we would map where they would work. Weston Green School, Thames Ditton, require a qualified Netball Coach to assist with the Girls Netball Programme. The role will start immediately and for the majority of the Autumn Term. 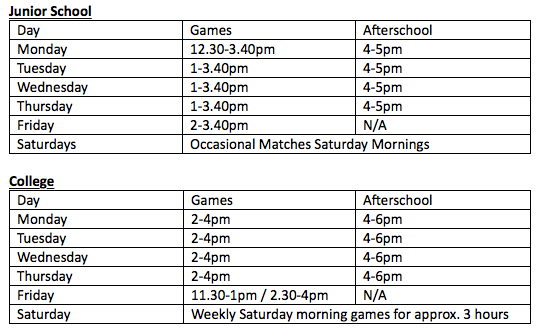 Times : 11am to 12.30pm Tuesday, 2-4pm on a Friday plus various matches at different time to cover matches where possible. The girls are aged between 7 & 11 years old. We are looking for a netball coach for our club, ideally starting mid-August. Old Reigatians Netball Club are based in Reigate and have two teams in the Surrey Netball League (Division 6 and 8). We train every Tuesday evening, 7.30-8.30pm at Reigate Grammar School, we do break for Christmas etc, but as a whole we train every week. We have around 25-30 members that make up two teams A and B, with some members just coming for fitness and building their confidence to then play in matches. Our matches are every second week, with home matches are played at also played RGS. We are looking for a coach to develop the team and deliver weekly training sessions, of course we will be paying the coach. We know it will be hard to find a coach that can commit to attending every match but I think as long as we have a coach who can commit to the Tuesday's training and at least half the matches that would be great. This would suit a person playing at a higher level looking for coaching experience, or someone who is already a netball coach/teacher or anyone who is interested in netball and has previous experience with coaching. Please forward onto those who you think may be interested. If you are interested or would like further information, please contact Charlotte on oldreigatiansnetball@hotmail.co.uk. St Georges University of London Netball are looking for a dynamic, enthusiastic and ambitious netball coach to help take our 4 student netball sports teams to the next level. Previous experience required and preferably the role requires you to have at least a Level 2 coaching award however open to discussion if previous proven results. Coaches will be required to organise and deliver weekly coaching sessions, help with team selection and liaise with the team captains and the netball president. Evening training sessions take place on Thursday evenings at the University (Rob Lowe Sports Hall). Please note the maximum number of weeks a coach will be employed is 24 weeks. For an informal discussion about the role, please feel free to contact Elizabeth Thorne via the number/email above. Walton and Hersham Junior Netball Club are looking for a new coach starting 16/17 season. The age group is from school Year 7 to 11. We currently have a strong U15/16s team and would like to develop the younger age groups as we have more girls attending training. We train at Cleves School, Oatlands Avenue in Weybridge on Wednesday evenings. 6-7pm is Years 7 & 8 followed by Years 9-11 until 8pm. Ideally would like a Level 2 coach but will consider someone who is working towards their level 2. Pay will be based on experience. Trials for new players will be held on 6th July, would be handy if the new coach could attend. Teddington Swans - Needs a Coach! We are an adult club playing in the Kingston District Netball League (Div 1, 3 & 10 from Sep 16) & Surrey Netball League (Div 8) and have 3 squads, varying in experience and ability. We are a team on the up, achieving 3 promotions and a KDNL Cup win across the club in the 15/16 Winter Season and are looking for a coach to continue this journey with. We train from 7.45pm- 9.45pm every Thursday (August/September - April) at Richmond College. Level 2 qualification and at least 1 year coaching adults is preferred however not mandatory and we will consider all applications. The position is paid (hourly) and there would be an expectation that the coach attends KDNL matches on a Saturday where possible. If you are interested or to apply please email the Club Chair on swansnetball@gmail.com outlining your experience and any qualifications. Teddington Thunder NC are looking for a qualified coach to run their training sessions. Training is every Sunday morning, 10.30am - 12pm, we train all year round. Training is held at Teddington School on the outdoor courts. The club is friendly, but competitive, and we have 2 teams. One team plays in the Kingston League and recently gained promotion to Div 9, having only joined the league in September. One team plays in Div 2 of Harlington League. Both teams have performed well in their respective leagues. We are looking for a committed coach to run training and help the players/teams improve their skills and match play. Pay is dependent on experience/qualifications, which can be discussed. St Mary’s is a high performance centre for sport and aims to maximise student engagement in sporting activity by increasing participation and sporting excellence, utilising the World Class Sports facilities. St Mary’s have recently developed a Strategy for Student Sport and aims to become a top performing British University & Colleges Sport (BUCS) institution. 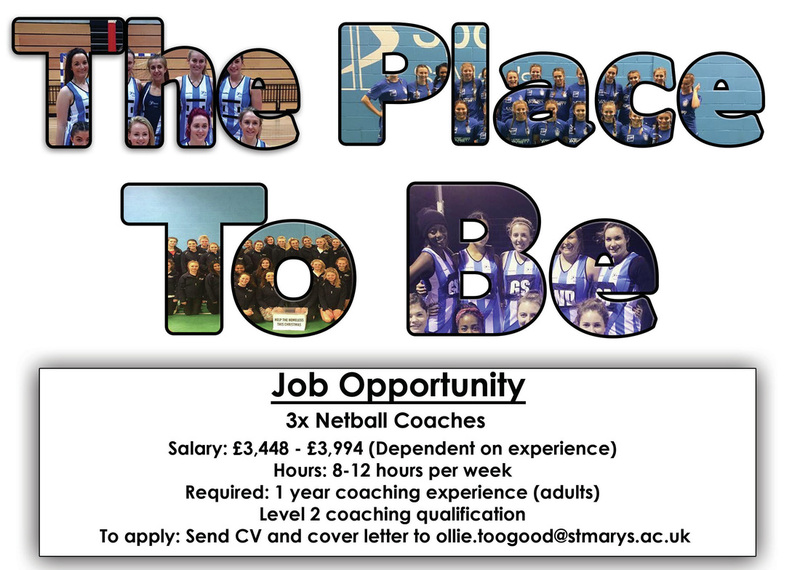 Sport Mary’s are looking for a passionate, experienced and inspiring Club Coach to lead the netball club in the 2015/2016 season. They successful applicant will instil a professional culture within the club and set clear goals that will contribute to the growth and development of the team. Netball is one of St Mary’s most popular sports with four teams competing in BUCS. With a main focus on the 1st team but providing support to the other teams, the coach will be responsible for delivering a structured coaching programme that will facilitate the development of players and drive the performance of the team. The post will be part time with approx. 5 hours required per week; this includes a minimum of one training sessions and matches on Wednesdays. It is desired that the coach is present at all matches. However, we will accept applications from those who cannot be present at all games due to other commitments but it may be taken into consideration when the candidate is selected.